- Publisher The Search to Belong: Rethinking Intimacy, Community, and Small Groups Copyright 2003 by Joseph R. Myers Youth Specialties products, 300 South Pierce Street, El Cajon, CA 92020, are published by Zondervan, 5300 Patterson Avenue, Southeast, Grand Rapids, MI 49530 Library of Congress Cataloging-in-Publication Data Myers, Joseph R., 1962- The search to belong : rethinking intimacy, community, and small groups / Joseph R. Myers. p. cm. ISBN-10: 0-310-25500-7 (pbk.) ISBN-13: 978-0-310-25500-0 (pbk.) 1. Community--Religious aspects--Christianity. 2. Small groups--Religious aspects--Christianity. 3. Intimacy (Psychology)--Religious aspects--Christianity. I. Title. BV4517.5.M94 2003 262'.2--dc21 2003005789 Unless otherwise indicated, all Scripture quotations are taken from the Holy Bible: New International Version (North American Edition). Copyright 1973, 1978, 1984 by International Bible Society. Used by permission of Zondervan. All rights reserved. No part of this publication may be reproduced, stored in a retrieval system, or transmitted in any form or by any means-electronic, mechanical, photocopy, recording, or any other-except for brief quotations in printed reviews, without the prior permission of the publisher. Web site addresses listed in this book were current at the time of publication. Please contact Youth Specialties via e-mail (YS@YouthSpecialties.com) to report URLs that are no longer operational and replacement URLs if available. Some of the anecdotal illustrations in this book are true and are included with the permission of the persons involved. All other illustrations are composites of true situations, and any resemblance to people living or dead is coincidental. Edited by Randy Frame Cover and interior design by Electricurrent Cover photo by Michael Wilson Printed in the United States of America the myths of belonging Our old ideas about space have exploded.The past three decades have produced more change in more cultures than any other time in history. Radically accelerated growth, deregulation, and globalization have redrawn our familiar maps and reset the parameters: Borders are inscribed and permeated, control zones imposed and violated, jurisdictions declared and ignored, markets pumped up and punctured.And at the same time, entirely new spatial conditions, demanding new definitions, have emerged.Where space was considered permanent, it now feels transitory-on its way to becoming.The words and ideas of architecture, once the official language of space, no longer seem capable of describing this proliferation of new conditions. But even as its utility is questioned in the real world, architectural language survives, its repertoire of concepts and metaphors resurrected to create clarity and definition in new, unfamiliar domains (think chat rooms,Web sites, and firewalls).Words that die in the real are reborn in the virtual.1 Rem Koolhaas, in a guest editorial for a special issue of Wired Wen our pastor rose to make the announcement, I suspected we were in for it again. "We're going to be a church of small groups," he told us, like a child pleading for his parents to read from the well-worn book one more time. "A church of small groups instead of a church with small groups." My heart sank. Been there; done that. I remembered attending a small group several years earlier. It was the next step in my process of growing deeper in Christ and in community. "Everyone in a small group" was the church-wide goal. So my wife, Sara, and I hopped in our car and began our eight-week commitment. We were greeted kindly at the door. It was not so much a friendship sort of kind as it was a salesman's type. "This is the first time," I told myself, "so relax and enjoy." 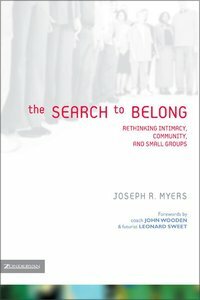 About "The Search to Belong"
The Search to Belong: Rethinking Intimacy, Community, and Small Groups Copyright 2003 by Joseph R. Myers Youth Specialties products, 300 South Pierce Street, El Cajon, CA 92020, are published by Zondervan, 5300 Patterson Avenue, Southeast, Grand Rapids, MI 49530 Library of Congress Cataloging-in-Publication Data Myers, Joseph R., 1962- The search to belong : rethinking intimacy, community, and small groups / Joseph R. Myers. p. cm. ISBN-10: 0-310-25500-7 (pbk.) ISBN-13: 978-0-310-25500-0 (pbk.) 1. Community--Religious aspects--Christianity. 2. Small groups--Religious aspects--Christianity. 3. Intimacy (Psychology)--Religious aspects--Christianity. I. Title. BV4517.5.M94 2003 262'.2--dc21 2003005789 Unless otherwise indicated, all Scripture quotations are taken from the Holy Bible: New International Version (North American Edition). Copyright 1973, 1978, 1984 by International Bible Society. Used by permission of Zondervan. All rights reserved. No part of this publication may be reproduced, stored in a retrieval system, or transmitted in any form or by any means-electronic, mechanical, photocopy, recording, or any other-except for brief quotations in printed reviews, without the prior permission of the publisher. Web site addresses listed in this book were current at the time of publication. Please contact Youth Specialties via e-mail (YS@YouthSpecialties.com) to report URLs that are no longer operational and replacement URLs if available. Some of the anecdotal illustrations in this book are true and are included with the permission of the persons involved. All other illustrations are composites of true situations, and any resemblance to people living or dead is coincidental. Edited by Randy Frame Cover and interior design by Electricurrent Cover photo by Michael Wilson Printed in the United States of America the myths of belonging Our old ideas about space have exploded.The past three decades have produced more change in more cultures than any other time in history. Radically accelerated growth, deregulation, and globalization have redrawn our familiar maps and reset the parameters: Borders are inscribed and permeated, control zones imposed and violated, jurisdictions declared and ignored, markets pumped up and punctured.And at the same time, entirely new spatial conditions, demanding new definitions, have emerged.Where space was considered permanent, it now feels transitory-on its way to becoming.The words and ideas of architecture, once the official language of space, no longer seem capable of describing this proliferation of new conditions. But even as its utility is questioned in the real world, architectural language survives, its repertoire of concepts and metaphors resurrected to create clarity and definition in new, unfamiliar domains (think chat rooms,Web sites, and firewalls).Words that die in the real are reborn in the virtual.1 Rem Koolhaas, in a guest editorial for a special issue of Wired Wen our pastor rose to make the announcement, I suspected we were in for it again. "We're going to be a church of small groups," he told us, like a child pleading for his parents to read from the well-worn book one more time. "A church of small groups instead of a church with small groups." My heart sank. Been there; done that. I remembered attending a small group several years earlier. It was the next step in my process of growing deeper in Christ and in community. "Everyone in a small group" was the church-wide goal. So my wife, Sara, and I hopped in our car and began our eight-week commitment. We were greeted kindly at the door. It was not so much a friendship sort of kind as it was a salesman's type. "This is the first time," I told myself, "so relax and enjoy." Joseph R. Myers is a multiprenuer, interventionist, and thinker. He is a founding partner of a communication arts group, SETTINGPACE, and owns a consulting firm, FrontPorch, which specializes in creating conversations that promote and develop community. the myths of belonging Our old ideas about space have exploded.The past three decades have produced more change in more cultures than any other time in history. Radically accelerated growth, deregulation, and globalization have redrawn our familiar maps and reset the parameters: Borders are inscribed and permeated, control zones imposed and violated, jurisdictions declared and ignored, markets pumped up and punctured.And at the same time, entirely new spatial conditions, demanding new definitions, have emerged.Where space was considered permanent, it now feels transitory---on its way to becoming.The words and ideas of architecture, once the official language of space, no longer seem capable of describing this proliferation of new conditions. But even as its utility is questioned in the real world, architectural language survives, its repertoire of concepts and metaphors resurrected to create clarity and definition in new, unfamiliar domains (think chat rooms,Web sites, and firewalls).Words that die in the real are reborn in the virtual.1 Rem Koolhaas, in a guest editorial for a special issue of Wired Wen our pastor rose to make the announcement, I suspected we were in for it again. 'We're going to be a church of small groups,' he told us, like a child pleading for his parents to read from the well-worn book one more time. 'A church of small groups instead of a church with small groups.' My heart sank. Been there; done that. I remembered attending a small group several years earlier. It was the next step in my process of growing deeper in Christ and in community. 'Everyone in a small group' was the church-wide goal. So my wife, Sara, and I hopped in our car and began our eight-week commitment. We were greeted kindly at the door. It was not so much a friendship sort of kind as it was a salesman's type. 'This is the first time,' I told myself, 'so relax and enjoy.' Once gathered in the 'family' room, we played several silly, juvenile games in the hope of opening the door to relational bliss. Next, we were asked to agree to and sign a Group Covenant. The covenant seemed harmless enough. It established a purpose for the group. It enlisted everyone to the 100 percent attendance policy. It explained a code of group life. It requested that we enter into accountable relationships with our new 'friends.' The covenant was very organizational and institutional. Its purpose, values, and vision were all clearly stated. Everyone signed on the line. Our well-trained leader promised that eight weeks later we would all arrive at a closer walk with God and with one another. Sounded promising and hopeful, so we started. By the third week I had had enough. I did not want to return to share my deepest thoughts. I did not want to give obvious answers to predictable questions from the published small group material. I did not want to play one more icebreaker game. I was not getting closer to anyone. Instead, I was getting angry. This group was expecting more from me than I wanted to deliver. And this group was trying to deliver to me more than I wanted. A church of small groups? Sounded like forced relational hell to me. Others tell of similar experiences.When a friend asked Miguel to help start a men's small group for the new year, he agreed at once.Through a contact in the hotel business, Miguel found the ideal meeting place and time: Holiday Inn at 6:30 a.m. on the second and fourth Tuesdays.The men would meet for breakfast, pray, read from a study book, and by 7:30 be on their separate ways to work. The group was launched and continued through the spring, summer, fall, and even the winter. Sometimes as few as four gathered, sometimes as many as seven. Every second and fourth Tuesday at 6:30 a.m., often on cold and dark mornings, they met. Through vacations, travel schedules, traffic tie-ups, the group met. As the second summer approached, someone suggested, 'Let's take a breather for a few months.' Everybody agreed.When September arrived, not one person suggested starting again. Common Myths of Belonging Community is a complex creature. Many factors contribute to finding successful community.With the erosion of the geographically close family and the heightened mobility of our culture, many people struggle to learn healthy competencies for community. Schools, service agencies, churches, and other organizations are making a concerted effort to help.Yet several common myths surround the search to belong, myths that dilute and confuse the definitions we employ to describe our journey to connect. More time = more belonging. The first myth is that the greater the amount of time spent in relationship with another person, the more authentic the community will be.This is a pervasive myth. In reality, time has little to do with a person's ability to experience significant belonging. Many people tell stories of first-time, episodic introductions from which a spontaneous connection emerges. Have you ever said, 'I just met you, but it seems like I've known you all my life.' Contrast this with Teri's feelings about Maggie.The two roomed together in college years ago, and ever since have exchanged Christmas cards and the occasional letter. Last summer Maggie invited herself to spend a few days with Teri. When Teri got the phone call, she immediately went to her pastor. 'I didn't like her then,' she groaned. 'I put up with her. Her side of the room was always filthy. She's domineering. I don't want her to come here.What do I do? We roomed together for four years, but we were never really friends.' Or, for still another perspective, Rose describes an experience at her church: About a month ago a woman named Sandra began attending. She is 56 years old. She came to our group last night. She has zero church background. Four years ago she was alone on a week-long vacation to Mexico. One morning by the pool, she struck up a conversation with the young woman sitting next to her. She learned that this young woman was there on her honeymoon. When the bride's husband joined her by the pool, Sandra tried to excuse herself, but they just kept talking with her. Sandra said that off and on during the rest of her vacation, she ran into this couple.They mentioned they attended a Vineyard church in California. Sandra was quick to mention to me, 'It wasn't like they were trying to recruit me or anything; it just came up in one of our conversations that they were Christians and where they went to church.' Sandra was so impressed with how kind they were, and she liked how they treated each other. She went away from them thinking they had something---values or a lifestyle---she found attractive. She told me probably once a year for the past four years she has thought about going to church. She looked in the phonebook for a Vineyard church (because she had no idea where else to go) and found us. A short connection around a swimming pool had significance years later. Belonging is not controlled by time, and time by itself does not develop belonging.